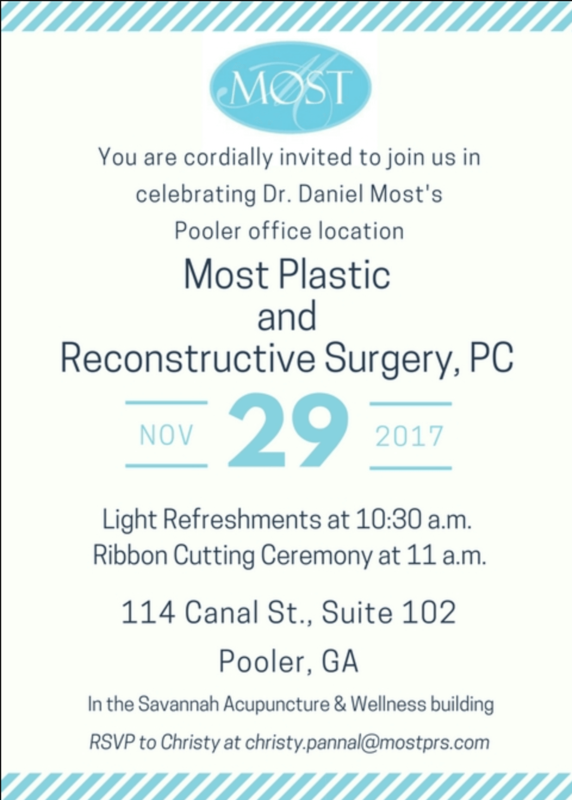 (SAVANNAH, GA) Dr. Daniel Most, a Savannah-based plastic surgeon, announces plans to cut the ribbon on the Most Plastic and Reconstructive Surgery office in Pooler. This Pooler location will allow Dr. Most to see patients in the West Chatham area on Wednesdays of every week. Dr. Most will cut the ribbon on Wednesday, November 29 at 11 a.m at 114 Canal St., Suite 102, in the Savannah Acupuncture and Wellness building. The public is invited to join Dr. Most and his staff for the ribbon-cutting ceremony. This event will also celebrate Dr. Most’s fifth anniversary of private practice in the greater Savannah area. Dr. Most, who specializes in a variety of cosmetic and reconstructive surgery procedures, is dually trained in both hand and microsurgery. He has practiced since 2005 and has operated Most Plastic and Reconstructive Surgery, PC, in the Savannah Medical Center since 2012. Dr. Most received his doctor of medicine degree from Stanford University in California, then completed a combined general surgery and plastic surgery residency at Johns Hopkins University in Baltimore and completed a hand and microsurgery fellowship at Harvard University in Boston. Dr. Most is known for leading-edge breast reconstruction techniques, the surgical procedure that restores shape to the breast after a mastectomy, the surgery that removes breast tissue to treat or prevent breast cancer. During the month of October, Dr. Most participated as one of the 2017 BigWigs for the Susan G. Komen Society of the Coastal Empire. Dr. Most is also a leading physician in the area of hand surgery and is the only Savannah surgeon who will work with the brachial plexus nerves in the neck region of the spinal cord. Dr. Most also treats peripheral nerve injuries, tumors and other disorders affecting the network of nerves that link the brain and spinal cord to other parts of the body. As a published researcher, Dr. Most’s writing has appeared in more than 30 publications in scientific journals and surgical textbooks, and he has presented his research nationally and internationally in lectures and community presentations. He is also a teacher in the field of plastic surgery and has received numerous honors and awards. Dr. Daniel Most, MD, has practiced plastic surgery since 2005, operating a private practice, Most Plastic and Reconstructive Surgery, P.C., at 5205 Frederick Street, Suite A, in Savannah, Ga., since 2012. He opened a second location at 114 Canal Street, Suite 102, in Pooler, Ga., in 2017. Dr. Most graduated from the University of California at San Diego with a B.S. in biology, obtained his doctor of medicine degree from Stanford University in California, then completed a combined general surgery and plastic surgery residency at Johns Hopkins University in Baltimore and completed a hand and microsurgery fellowship at Harvard University in Boston. He is a clinical associate professor of surgery at Mercer University School of Medicine, Savannah campus. He is on staff at Memorial Health University Medical Center, the St. Joseph/Candler Health System and Liberty Regional Medical Center and is a participating provider for most insurance policies. He is fluent in Spanish and has performed charity surgery work in Matagalpa, Nicaragua. For more information, contact Dr. Most at 912-303-6678 or visit online at www.mostplasticsurgery.com.